This USB Network Adapter is a convenient and economical solution to add a USB drive (eg: memory stick or hard drive) to a Smart SoftPLC controller or Gateway. 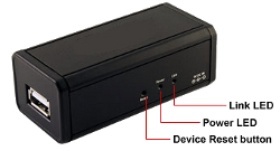 This provides a large capacity, easily removable storage media for data logging applications. The adapter connects to one of the Smart Ethernet ports, and provides a USB 2.0/1.1 compatible port for a mass storage device (eg: a memory stick or hard drive). The SPO-NUA comes with a 1 foot CAT5 Ethernet cable and a 110/220VAC to 5VDC power adapter.